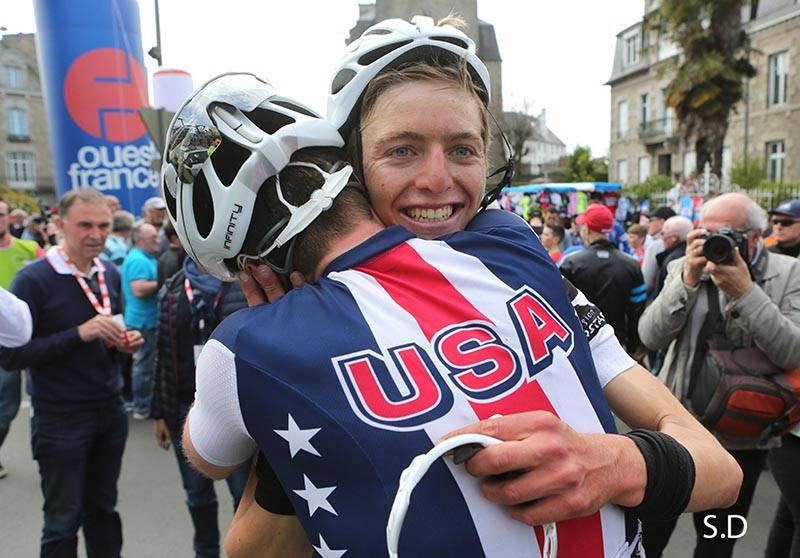 Adrien Costa of the Axeon Hagens Berman Cycling Team became the first American to win Le Tour de Bretagne Cycliste in its 50-year history Sunday while racing for USA Cycling's Under 23 squad. The 18-year-old from Bend, Oregon, impressively soloed to win Thursday's queen stage of the race, then nursed an eight-second lead the next three days to land the biggest victory of his young career. "It hasn't really sunk in because I wasn't thinking about the overall win as a true possibility," Costa said. "After I won that stage, I tried to enjoy that victory as much as possible. I didn't put too much pressure on myself for the overall win. Just being a first-year Under 23 rider, I was already happy to have won a stage. So that kind of helped me stay relaxed. I just can't believe it." The Tour de Bretagne Cycliste often acts as a showcase for upcoming riders in the Under 23 category who race together with Elite riders. The race was renamed Tour de Bretagne in 2005 when it started including professionals. Past winners include Giro d'Italia champion Eugeni Berzin (1992) and world cyclocross champion Lars Boom (2007). 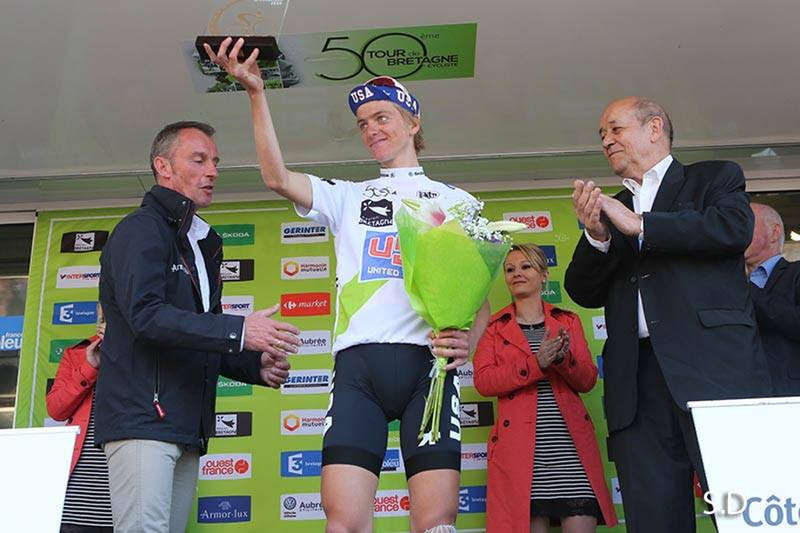 Adrien Costa is congratulated after winning Le Tour de Bretagne Cycliste by seven seconds. Costa's win is the fourth in Europe this season by four different Axeon Hagens Berman riders and the sixth overall for the American continental team that is managed by former Belgian national road champion and Olympic bronze medalist Axel Merckx. In its first eight years of existence, 18 riders from the program have advanced to the WorldTour ranks. "This is a huge win - as much for him and for USA Cycling's program as it is for us," Merckx said. "We are very excited about this. But you have to keep in mind Adrien is still very young and that puts a lot of pressure and stress on him. We don't want to burn him out. It is easy for us to go and put him in every single race because he is the next big talent. But we could burn him out like that. So we have to be careful and very particular. Riders like that still need to recover and still need their rest and to be able to grow physically and emotionally." Sunday's final stage of 194 kilometers from Le Hinglé to the walled Breton town of Dinan was not without drama. Costa had only two USA Cycling teammates on the start line with him: Sean Bennett and Greg Daniel, who is also on Axeon Hagens Berman. The team's other others were lost Saturday: two by time cut and Colin Joyce - another Axeon rider who finished third on Thursday's stage - did not start. "It was nearly an impossible task," said Mike Sayers, head coach of USA Cycling's Under 23 Development Program. "To try and defend against the peloton that was here - that was a big ask." Costa said he was feeling up to the challenge. "Before the stage, we had Sean and Greg set their finish line at 120 kilometers, which was the entrance of the circuits," he said. "We got pretty lucky today because the breakaway that went off did not have any big teams. So their gap never got huge. Sean and Greg did a fantastic job for 60 or 70 kilometers on the front, keeping me out of trouble and keeping the gap manageable. So I had a really relaxed ride into the circuit." From there, Costa showed off the skills that earned him a pair of silver world championship medals in the junior individual time trial in 2014 and 2015 by bridging across to riders who threatened to get away. "Thankfully it was a hard circuit which suits me," he said. "On the climb, I was able to keep everyone marked. Then it was pretty technical the rest of the way, which made it easier to keep things together. At the end of the day, today's stage was a lot less stressful mentally and physically than the last two days. Especially yesterday, when the breakaway had an eight-minute lead and I thought we had lost the race. So in that respect, today was a lot easier day." Nick Schultz (SEG Racing Academy) took the win Sunday as Costa finished fourth, four seconds back. His final margin of victory was seven seconds over stage runner-up Frantisek Sisr (Klein Constantia). Lennard Hofstede (Rabobank Development Team) was third, 13 seconds back of Costa. Sayers pointed to the unselfish teamwork of Bennett and Daniel for being a key part of the win. "They are not going to get a lot of press out of this," he said, "but the fact is we could not have done this without those two guys. They set the table for the meal to happen and they need to get recognized for what they did. They really, really, really dug extremely deep and were completely selfless in the whole process. That really says a lot." Costa is the first American winner in the race's 50-year history.